When a small/medium sized nonprofit has an Executive opening they can easily get 75 – 125 job applicants. Just like in the for profit industry, it is easy to reduce this to the top 8-15 to look at seriously and then it becomes complicated. No one is perfect, some are quite interesting, one would be a breath of fresh air, that one is young - but seems so dynamic, etc. When I work with a nonprofit search committee, the first thing we do is decide on the process and timeline. The next task is writing the job description. The job description shouldn’t be just a list of responsibilities. It should be a window on the soul of your organization and clearly state the key hands-on responsibilities for the incumbent. This is your starting point. So far, so good. Now the going gets tough. Unlike the for profit sector, where hiring decisions are often made by one person – the hiring manager – in the nonprofit sector there are usually two groups involved in the decision – the Search Committee (SC) and the Board. I am not suggesting a change in that process but this article is about a particular pitfall that needs to be considered – the length of the process. When you have two committees that must agree you are asking for time delay unless you are disciplined and focused on the importance of not letting that happen. Since there are so many candidates up front, a Search Committee can easily feel like they are in the driver’s seat and it is all a one way process where they will select the best candidate(s). Unfortunately, it is a two way process and this isn’t always recognized. Candidate received another offer (39%). Compensation and benefits are not in line with the candidate’s expectations (29%). Candidate received a counteroffer from his or her current company (10%). 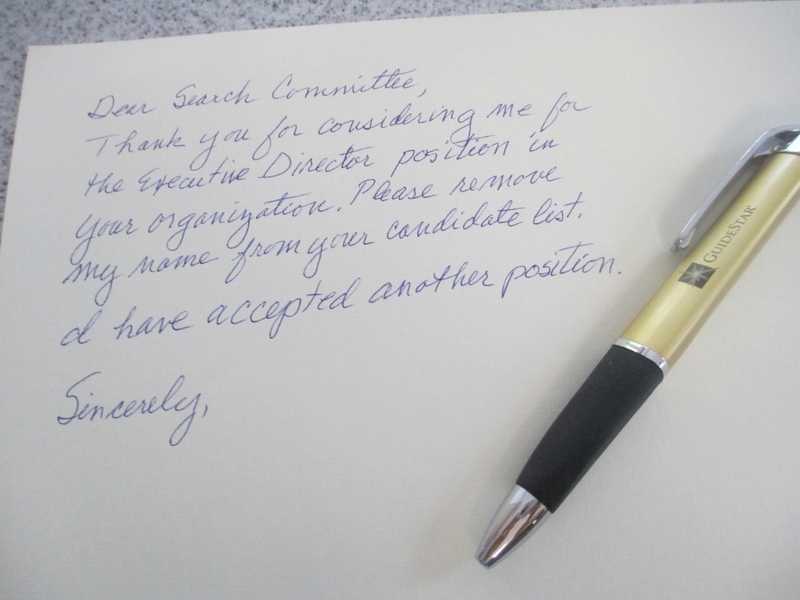 I will add that in the nonprofit sector – the process takes too long and the best candidates simply accept another job offer. The main reason this happens is that the Search process takes too long. When candidates are in a job/career advancement search they are pursuing multiple opportunities at the same time. The people who look like the best candidates to you, also look that way to other organizations. Once a search has begun, it is important to move the process along in a timely manner or your opening loses its freshness and best candidates accept other job offers. I have seen Search Committees set in person interviews for three weeks into the future and half their candidates melt away. Yes there were 70 others who applied but only 4-5 by this point (after telephone interviews with me) they wanted to interview. Now is when I see glancing at the resumes of those lost….if only we met last week….and I was willing to skip that other meeting…. Search Committees and Boards are made up of people who have day jobs. It is difficult to set meeting dates that work with all of them. When I work with a committee we set a calendar of dates upfront and stick to it. This usually includes setting a full Board meeting date for interview(s). This gives the Search committee a deadline that they will want to meet. You can have conference calls in early morning or late evening if necessary but stay on schedule. All resumes can be posted to a shared online (Google Drive works) folder so that SC members can review on their own schedule rather than at meetings. Don't let face to face meetings become a roadblock to keeping your search process on track. I can’t emphasize how important this is and it is the one potential pitfall I always see. As a consultant, I am not the boss, but I always try to steer the ship away from this problem. It is important to offer a reasonable salary and benefits. How do you know the going rate? It is worth the investment to get the Guidestar Nonprofit Compensation Report or the Nonprofit Times Salary Report. These reports will give you a clear picture of salary ranges for organizations like your own. You can also scour ads to see what other similar positions are listed at. This may very well be an excellent candidate but you have to just let this one go. You may have sought this candidate out who was not in a search and they are happy to get a raise and stay where they are. This may be someone who was only a candidate for your position because of the pay level in their current position. Who knows. But believe me – it was not meant to be. So to wrap up. Approach your search for an executive with enthusiasm, discipline, honesty and knowledge. If you’d like to work with me, you can reach me at marion@marionconway.com.